14 August 2017. An experiment to grow a crystallized form of protein associated with Parkinson’s disease is among the cargo that lifted off today from NASA’s Kennedy Space Center. 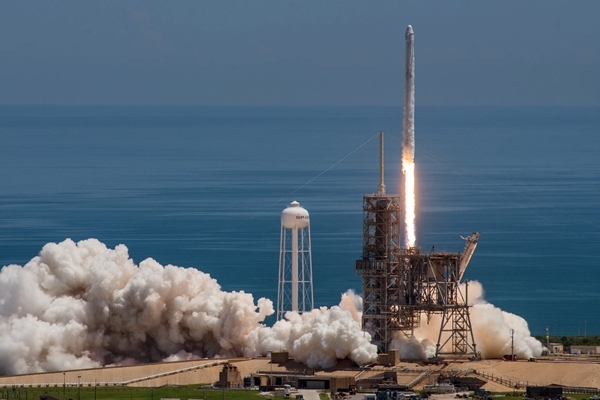 The cargo of some 6,400 pounds in the SpaceX Dragon space craft aboard a Falcon 9 rocket includes an experiment, designed by researchers with the Michael J. Fox Foundation, expected to arrive at the International Space Station on Wednesday, 16 August. Parkinson’s disease occurs when the brain produces less of the substance dopamine, a neurotransmitter that sends signals from one neuron or nerve cell to another. As the level of dopamine lowers, people with Parkinson’s disease become less able to control their bodily movements and emotions. Symptoms include tremors, i.e. shaking, slowness and rigidity in movements, loss of facial expression, decreased ability to control blinking and swallowing, and in some cases, depression and anxiety. According to Parkinson’s Disease Foundation, some 60,000 new cases of Parkinson’s disease are diagnosed in the U.S. each year, with more than 10 million people worldwide living with the disease. The experiment sent into space aims to grow crystals of a protein coded by the leucine-rich repeat kinase 2, or LRRK2, gene. While Parkinson’s disease is not believed to be inherited in most cases, about 10 percent of people with the disorder are found with mutations in the LRRK2 gene. In some ethnic groups, such as Jews of Eastern European origin, also known as Ashkenazi Jews, Berbers in North Africa, and people in the Basque region of Spain and France, rates of LRRK2 mutations are higher, from 15 to 40 percent of Parkinson’s disease cases. The protein coded by LRRK2, known as dardarin, is a building block of other proteins in the body, but its role in the development of Parkinson’s disease is not well understood. Studying proteins often requires converting them into crystals that provide details about their chemical structure, and thus clues for their activity in the body. On earth, however, this protein is small and compact. In conditions of microgravity, the protein may be able to grow into larger crystals, providing better data to target the protein in therapies. The Michael J. Fox Foundation funded work by researchers at Oxford University in the U.K. and University of Frankfurt in Germany to prepare the LRRK2-derived proteins for transport to the International Space Station. After about a month, crystals grown on the space station will be returned to earth for further analysis by the same team, joined by colleagues from University of California at San Diego. The LRRK2 experiment is one of 250 research items in the Dragon space craft’s cargo. The Dragon is expected to return with about 3,000 pounds of cargo, including the LRRK2 protein crystals, in about a month.